Three types of books have inspired my work on the filmmaker Robert Guédiguian and the role that friendship plays in his career. First, general books on film and philosophy: Bazin’s What is cinema?, Cavell’s The World Viewed or Pursuits of Happiness, Laura U. Marks The Skin of the Film, and classic works on the philosophy of friendship. I should give individual credit to my colleague and friend Todd May and his book Friendship in an Age of Economics. In French film: I have always admired books like Alan Williams’ Republic of Images, or Phil Powrie’s books, authored or edited, on separate decades in French cinema: these works move deftly between film analysis, theory, and historical context. Finally books on single filmmakers: though I have written another book on a pair of filmmakers (the Dardenne Brothers) I do not often read such work. However, the Manchester series of French filmmakers has several excellent models I have read in preparation for this or other projects (O’Shaugnessy’s Jean Renoir, Reader’s Robert Bresson, Cooper’s Chris Marker, Harris’ Bertrand Blier come to mind, but there are others). Since friendship plays such an important part in the project, I had to think long and hard about the links between the cinema as a practice and the ways in which people, through their relationships with each other, give meaningfulness to their lives. This somehow lifted Guédiguian’s work out of the cinema and made it, for me, a project that deals in some of the widest and most important aspects of life. 4. What did you enjoy the most about writing your book? The book describes one particular lifelong project: the career of Robert Guédiguian and how that career is in many ways a collective act, even a monument, built in a particular space, by individuals who love each other and who are concerned about each other’s wellbeing. It was for me a pleasure to discover or rediscover some of the classic philosophical writings on the concept of friendship, to digest them, and to learn to express their ideas in a coherent (I hope) way. It was also a chance to do what the cinema invites us to do at every turn: examine my own life and consider my own friendships and how they contribute to my own flourishing. 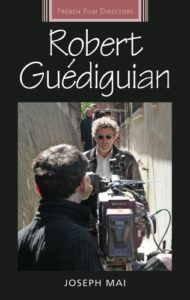 I hope the book will appeal not only to people interested in Guédiguian, but also to people interested in cinematic practices and their relation to philosophical concepts and social struggles. Guédiguian’s work has sometimes been discounted as being full of “bons sentiments,” or good feelings, perhaps a bit mawkish, and politically simplistic. I actually agree with some of these criticisms and find some of Guédiguian’s films less compelling than others, and at times it was a challenge to get past some of my reticence so that I could see what I believe is profoundly original in his work. This is, in fact, something deep about friendships in general: from the outside, individual friendships can seem silly or incomprehensible (“god those two are so obnoxious when they’re together!”), and at times it was not entirely easy to feel “inside” the films themselves. I hope that my readers will let Guédiguian’s films convey to them their very deep coherence and originality. I have also published a book on the Dardenne brothers (Jean-Pierre and Luc Dardenne, University of Illinois 2010). Happy, but also as if someone had just caught me doing something extremely embarrassing and published a photo of it online. With my first book, I wanted to begin a critical discussion of the works of the Dardenne brothers. With this one it was the series itself that interests me. I wanted to examine a coherent, long-term project, that had these philosophical roots, and a series that aims at describing the career of a filmmaker once it has taken pretty definite shape was inspiring (not that every book in the series needs to do that). The project really showed me how fragile a lifetime can be, and how much responsibility an academic has in describing someone’s career. Only in keeping constantly in mind this overarching perspective on Guédiguian’s work as a career. I continue to be interested in how film can make its viewers explore philosophical, ethical, and political problems. I am reflecting on the cinema of Arnaud Desplechin, for instance, and have been working on the cinema of Rithy Panh as well for some time (in addition to its exploration of trauma and genocide, it introduces many interesting questions about the nature of “world cinema”). I am also crossing my fingers on a long project to translate an important film text from French to English. Since nothing is certain at this point I prefer to keep the title to myself! Joseph Mai is the author of Robert Guédiguian, now available from Manchester University Press. Category: Author Q&A, Blog, Cinema, Film & Media, French Film	0 Comments.